In November this year, John Mayall will turn 80 years old – or should I say young, I am pretty sure he is still touring and recording. He was probably turning 36 when I was riding on a train from Sydney to Penrith with my latest “haul” from a day’s hunting in Martins & Ashwoods record stores. One of the treasures in the brown paper bag from Martins – a copy of John Mayall and the Bluesbreakers with Eric Clapton – the “Beano” album. It had been high on my list for a while. In late 1968 Cream’s White Room had been on heavy rotation on Sydney radio, in early 1969 it hit the top of the charts. So, Eric Clapton was sought after. I’d heard Mayall before but when I heard this album at Glen Davidson’s place (Glen’s collection was well advanced by this point), I coveted it. Mayall was already known as the “Father of British Blues” – he’s probably the Great-Grandfather now … and still going strong. The song at this intersection comes from Mayall’s following album Hard Road. Stunning as it is – and being informed by many that it was better than “Beano” – this album still did not find its way into the collection until years later. 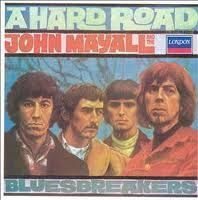 The line-up for Hard Road John Mayall, Peter Green, John McVie, and Aynsley Dunbar. The song I’ve chosen – The Super-Natural – is still one of my favourites. I get a chill every time I listen to it. 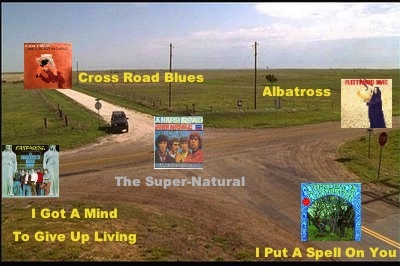 How does “The Super-Natural” connect with Cross Road Blues? Well, the title itself suggests a link, if not to the song directly certainly to the mythology around Robert Johnson – what could be more supernatural than meeting with the devil at midnight to do a deal? It’s haunting – the perfect soundtrack for a transaction between mortal & demon where the immortal soul is traded for guitar virtuosity in the shadows of midnight. Hell, the guitar work is of such virtuosity it may well have been bestowed in a similar exchange. The guitarist (and composer) is, of course, none other than Peter Green. Further connecting back to Robert Johnson, Peter Green confronted massive problems in his life. At one stage finding himself institutionalised and being subjected to ECT (electro-convulsive therapy). In many circles (though none I mix in) the behaviours that got him there might be seen to be a result of being possessed. Fortunately, with help from his brother, Peter emerged and eventually formed The Peter Green Splinter Group. They released a couple of albums entirely dedicated to the songs of … yep, Robert Johnson. John Mayall’s Official Website – it’s not that great. The history is all too brief, the photo gallery doesn’t have anything pre-2005. I couldn’t find much else on Mayall or the Bluesbreakers. There is certainly plenty about individual members of the Bluesbreakers and hopefully I will get to point you to some of that material later in this journey. The Peter Green Splinter Group playing The Super-Natural live on German TV in 1998. Mayall came close to losing Aynsley Dunbar to a young American guitarist, newly arrived in London, who was auditioning for a drummer and a bass player. As Chas Chandler later recounted, when Jimi Hendrix was searching for a suitable drummer, both Aynsley Dunbar and Mitch Mitchell were equally in the running for the job. Unable to choose between Dunbar and Mitchell, Hendrix and Chandler decided the matter with a toss of the coin and Dunbar returned to the Bluesbreakers without Mayall being any the wiser. To the North: We’ve just come from there – Cross Road Blues lies to northwards. To the East: Albatross by Fleetwood Mac.